There are two basic types of graphic images: bitmap (or raster) images and vector images. In the first case, the image is defined in terms of rows and columns of individual pixels, each with its own color. In the second case, the image is defined in terms of lines, both straight and curved. A single straight line is described in terms of its two end points. The difference in these types of graphic images becomes readily apparent when a drawing is enlarged. The same line is shown on the left and right. On the left it is displayed as a bitmap image, while on the right it is displayed as a vector. In both cases, the line has been scaled up by a factor of four from its nominal size. When the bitmap resolution of a drawing matches the display resolution, the objects in the drawing look smooth. 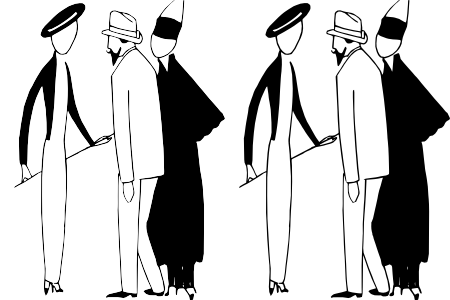 The same drawing, but defined as a bitmap image on the left and a vector image on the right. If the output device has the same resolution as the bitmap image, there is little difference between the appearance of the two images. If the bitmap resolution is significantly less than the display resolution, the display will show jagged lines. The head of the gentleman in the above drawings has been scaled up by a factor of five. 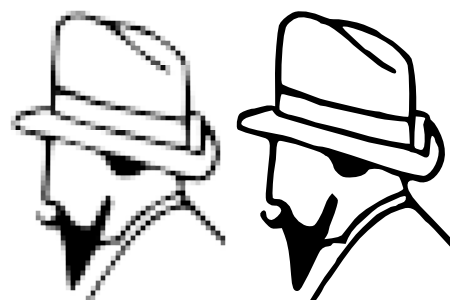 Now one can see a difference in the quality of the bitmap drawing (left) and the vector drawing (right). Note that the bitmap image uses anti-aliasing, a method of using grayscale to attempt to smooth the drawing. All output devices, with few exceptions, use a raster or bitmap image to display graphics. The real difference between drawing with bitmap graphics and vector graphics is the point at which the image is converted into a bitmap. In the case of vector graphics, this conversion is done at the very last step before display, ensuring that the final image matches exactly the resolution of the output device. The few vector output devices include large plotters for engineering and architectural drawings and archaic Tektronix terminals.